As a popular video-sharing website, Vimeo gives us a good place to upload, store, and share their videos over the worldwide web. Depending on your type of account, there are many file formats that Vimeo supports. MOV and MP4 files are two of the most common files uploaded over at the site. Files with dav file extension can be typically encountered as older video recordings from video recorders and security camera systems, for example theDVR365 series. Specially encrypted and encoded MPEG that can be only viewed using the default DVR365 Player. The point here, you will find it’s a painful experience to upload DAV files to Vimeo. Don’t know how to upload DAV files to Vimeo for sharing with your family and friends? Here, you will find the best solution to easily upload DAV videos to Vimeo, the way is that you need to convert DAV to a Vimeo-friendly format prior to uploding. UFUSoft DAV File Converter is an excellent DAV video conversion tool. 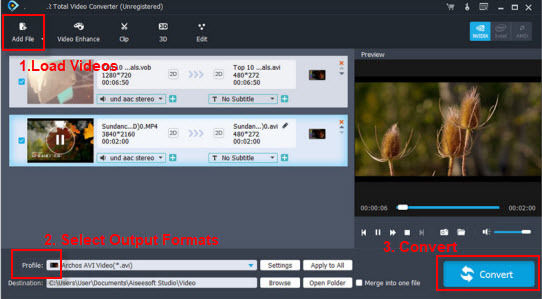 It can help you encode almost any video to Vimeo recommended H.264 encoded MOV or MP4 files with zero quality loss. To make it easy for you to convert mvoies to Vimeo supported format, DAV Video Converter offers optimized preset for Vimeo, you can re-encode DAV, AVI, MKV, VOB, MTS, AVCHD, MXF, TiVo to Vimeo in simple clicks and no need to worrry about the format compatibility. If you’re a Mac user, please turn to Video Converter for Mac to convert and upload your video files to Vimeo on Mac (including macOS Sierra, Mac EI Capitan). Now download the right version of the program and follow the guide below. First download and install DAV File Converter. When complete, start the program from Start menu or Windows desktop and then drag and drop your DAV. files you want to upload to vimeo to the software. Next, specify the output video format. You don’t need to be confused about what format to choose. Video preset for Vimeo has been provided. Just click “Profile”, go to “Online Video” category and set “Vimeo” as your output video format. After the above two steps, go back to the main interface and click the “Convert” button to begin converting DAV to Vimeo highly compatible MP4 video files. When the conversion is done, click “Open” to locate the converted videos and upload them to Vimeo with ease! How to Convert DAV to AVI with DAV to AVI Converter?